Most plants need pollinators, which are usually rewarded with nectar. Competition requires that there are new examples of one’s own species ready to take over. So reproduction is a necessity and plants are very active in this respect. They have to attract pollinators. 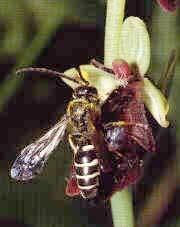 This they do with the help of nectar and pollen. In order to show pollinators that there is something worth finding, plants signal to them with big colourful flowers. But not all pollinators can see all colours so sometimes additional methods have developed, e.g. smells that can attract them. The substances which give this effect are called attractors and are volatile substances known as essential oils. 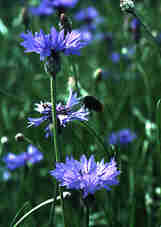 However it is costly for the plant to pay the pollinator for its visit by filling the flower with nectar. A competitive method that has developed which ’makes it cheaper’ for the plant is deceptive marketing. If the flowers of one species resemble those of another kind that contains a lot of nectar, the first flower can cheat the pollinator by having no nectar at all. The flowers of some plants even look and smell like the females of certain insect species which make them totally irresistible to the males of those species. When the male arrives at the flower it tries to mate with it.